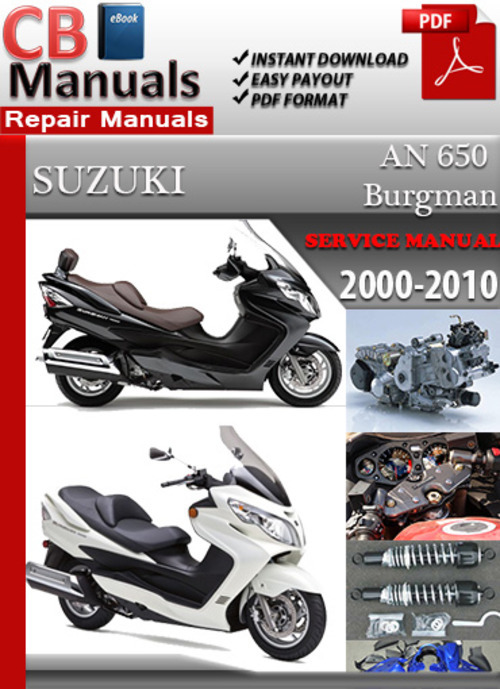 This is a complete Suzuki AN 650 Burgman 2000-2010 Service and Repair Manual ! It contains all the information and detalis you need to help you not only fix your vehicle problems, but also maintain your vehicle good functioning for future use ! This manual is also a very reliable source of information that will make you, in time know more and more about your vehicle and how to prevent future problems from happening !! Download Now the Suzuki AN 650 Burgman 2000 2001 2002 2003 2004 2005 2006 2007 2008 2009 2010 Service Repair Manual and you will recive it instantly via email. No shipping cost or waiting. Instant Download. Other information that might describe this product !